This episode we’re gonna be baaaaad! Jon, Murph, and Chad workshop how to make good bad guys. This episode was recorded on March 14, 2019. The National Library of Australia recently approached Chaosium to ask if the company would donate Terror Australis to their collection, as part of the library’s mission to collect resources “of national significance relating to Australia and the Australian people”. So they sent a copy of the new edition plus the original version from 1987. The new edition is currently available in PDF, and it will be released in full color hardback later in March. There are many more quality fan-made products available in the Miskatonic Repository. So go check ‘em out. A company called Just Crunch Games has released a new scenario for the rules-light system called The Cthulhu Hack. The scenario is called Valkyrie Nine, set in the late 21st Century on a lunar station. Valkyrie Nine is available in print (All Rolled Up) and PDF (DriveThruRPG). 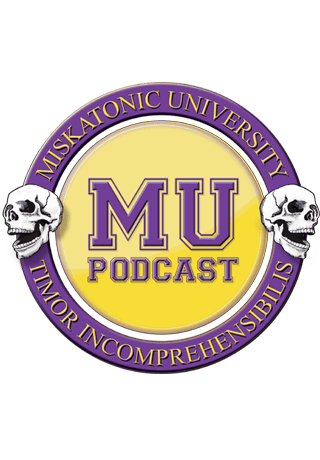 Chaosium’s Miskatonic University – The Restricted Collection game is out in the wild! Modiphius Entertainment have released Call of Cthulhu 7th Edition versions of their Achtung! Cthulhu Investigator’s and Keeper’s Guides. At the time of this recording, Oscar Rios will be launching An Inner Darkness Kickstarter at midnight, Eastern. A sneak peak of the Kickstarter video was posted on Facebook, and it looks amazing. If you’re listening to this episode soon after it went live, you still have time to back this book. 2019 marks the 40th anniversary of Ridley Scott’s groundbreaking film, ALIEN! To celebrate, six short films set in the ALIEN universe are coming out from AlienUniverse.com . There were some public screenings at Emerald City Comic Con and C2E2, and the online releases of the films will be on IGN every Friday, starting on March 29th. The Chemical Formulary – A series of books that contain the formulas for a wide variety of compounds and items; for example: solidified fuel, tracer ammunition, epoxies, adhesives, resins, gums, and waxes. The first three volumes of the 1933 work are on the internet archive. Keepers might mine The Chemical Formulary for inspiration in scenarios where the investigators need to concoct their own chemical tool or chemical weapon. The formulas may also inspire Keepers to create their own Mythos Chemical Formulary. Thank you again to Graham for sending in this fantastic Card Catalog idea. If you have an idea for a Card Catalog entry, please email us or post it in our forums. Mr. Tyler is back again – Back in Black, one could say, with a look at The Black Paintings of weird Spanish painter Francisco Goya. What is one of your favorite human villains in published scenarios? Why? What’s the best Mythos villain? Why? What character traits make the best villain? Using randomness websites above, generate a random character. Discuss what the character wants. Method 1: Roll a random monster from Malleus. Discuss how the character THINKS this entity/creature might help the character get what they want. Method 2: Pick a random Mythos artifact that the character THINKS will help the character get what they want. (will have to figure out how to randomize that).